Nintendo’s rather perplexing new announcement this week is Labo, a set of peripherals for the Switch made from cardboard. While they may seem like an odd addition after the company’s renewed focus on more mature titles and nostalgia, it’s part of Nintendo’s pattern of embracing the bizarre and making it work. 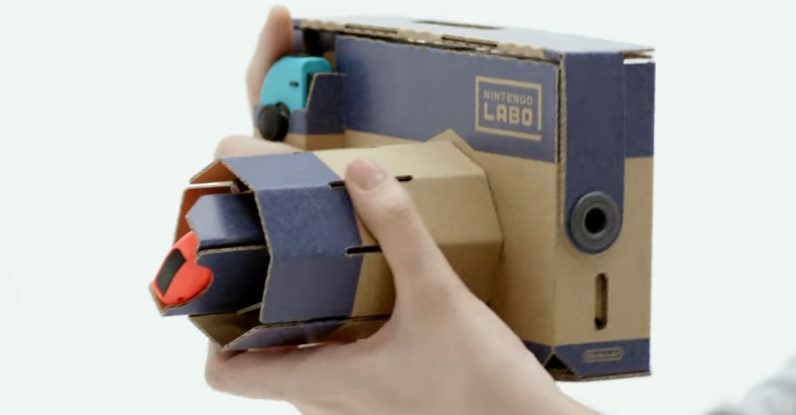 What at first glance looks a little baffling about Labo — its use of cardboard rather than plastic, and DIY focus — is what makes it look so alien compared to just about everything else currently in the gaming market. It’s clearly aimed at children, and, though I question whether cardboard is durable enough to last in the hands of smaller children, it’s a fascinating experiment that I think will set a chain of imitators in motion. I’m getting deja vu for a time when the motion controller for the Wii was a new peripheral capitalizing on tech perceived as gimmicky and directed at families with kids. Now look where we are: a world where motion controllers are a core part of many, up to and including the burgeoning VR market. Up to now, the Switch has come across as a hybrid of Nintendo’s usual self-referential nostalgia and an attempt to appeal to seasoned gamers — why else would they port Dark Souls to the console if not to capture the attention of the incurable masochists who play it? But if Labo can bring a fresh audience of eager youngsters to the Switch, I suspect we might see more of Nintendo’s kid-focused peripherals trickling into other consoles — not in the same form, or the same medium, or with the same intentions, but I think it’ll leave a bigger mark than we might yet realize.